Last year I worked with the remarkable LinkedIn Research Network on a major survey of professionals’ job-hunting status. We refreshed the survey this year, and surprisingly, not much has changed: 83% of fully-employed respondents are not actively looking while only 17% are. Within a few percentage points, this is the same as last year. The graph below summarizes the job-hunting status of the 4,550 respondents and what each group would look for if they were to switch jobs. Obviously, the less active the person, the more selective he or she was from a job needs standpoint. Interestingly, of the 17% who were active candidates, less than half were first going to a company career site to find a job of interest. Instead these active job hunters were either trying to get a referral through an employee, or first searching for a job using a search engine or aggregator. The 83% who classified themselves as passive split up into three big groups. The Tiptoers, 15% of the total, were very quietly and selectively contacting former co-workers to see if anything of merit was available. So in some way, these people could be considered slightly active. However, they would only move for a better job. Explorers (40% of the total respondents), who were open to explore a situation if a recruiter called, would only consider a major career move to make the switch. Super Passives, at 28%, were not looking at all, but most were still open to connect with a recruiter for future opportunities, making them a great group to network with. 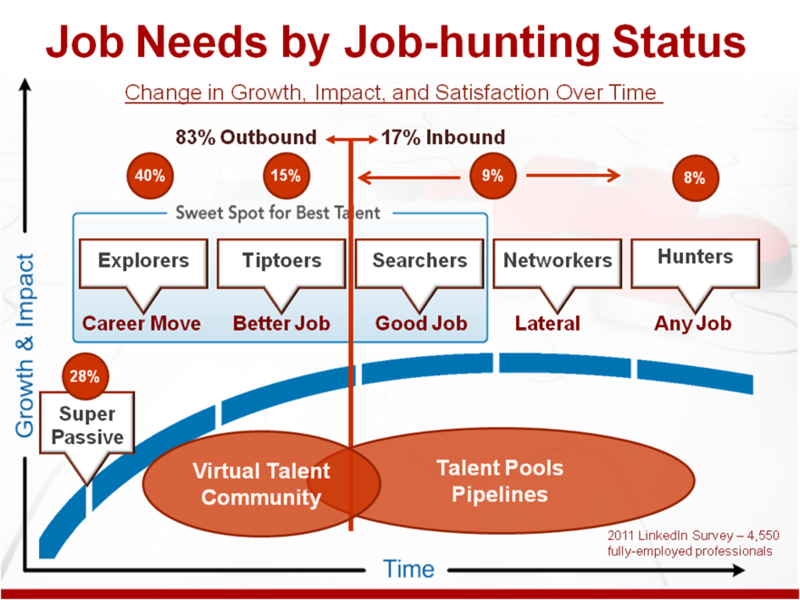 In my mind, the sweet spot for sourcing and maximizing Quality of Hire includes Explorers, Tiptoers and Searchers. Searchers are active candidates who have just entered the job-hunting market, and getting to them first is a huge competitive advantage. This is where SEO/SEM comes into play. But you’d better not use boring job descriptions to capture their attention, since they’re looking for something better than what they now have. Remember, they are fully-employed and more discriminating than the very active candidates. Since Tiptoers have indicated some interest in leaving, the best way to connect with them is through your employee referral program. Make sure your employees reach out to their best former co-workers and connect with them ahead of time. Then when the Tiptoers start looking, they’ll find your employees first. But again, make sure your jobs are compelling. Tiptoers are looking for something much better than they now have. To find Explorers, I suggest using LinkedIn Recruiter by connecting with your employees and searching their first degree connections. Cherry pick the best from their network, ask your employee about their qualifications, then contact them. Since they’re prequalified and will call you back, you’ll be able to shorten the time to build a slate of final candidates to a few days. 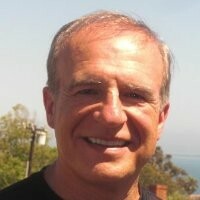 However, to be successful, it is vital you understand how to recruit and network with these people. Recognize that the recruiting process and workflow needed to source and recruit passive candidates is far different than the process used for active candidates. Explorers in particular will only engage with a corporate recruiter if the opening sounds like a great career opportunity, and even then they’ll want lots of information before proceeding. Despite this, Explorers are worth the time and effort. As the labor markets continue to heat up, the first half of 2012 could be more challenging from a recruiting standpoint than thought just a few months ago. LinkedIn Recruiter is a great asset though, and in the right hands can help you through the toughest of recruiting challenges. All it requires to take full advantage of this vast network is a great recruiter and a great job. What else could you ask for?